At collective-run, rural community the Burnlaw Centre situated through fields and between trees, we will play on the open air Disc Golf course, harness interactive systems to generate new approaches to collaborative creation with Christian Jendreiko, discuss alternative communities as an open form collaboration with John W. Fail and watch resident Christo Wallers' curated film programme. We will renew performance poetry with Anne-James Chaton at experimental print studio Foundation Press. Using local collections at The Shipley Art Gallery, Giles Bailey will lead us in creating performance which unlocks the latent power of anonymous artefacts. Rory Pilgrim will explore connections between technology, disability and care as a way of looking at larger political frameworks – interweaving poetry, speech, song and choreography. We will expel our experience with G.O.D.S (Glasgow Open Dance School) who will communally choreograph a ritual based on daily lived experiences of the Northeast. 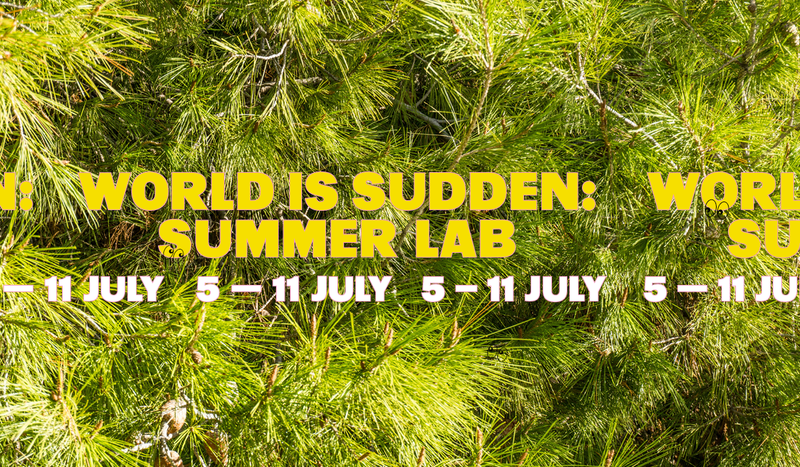 World is Sudden: Summer Lab is ideal for artists, writers, researchers, performers or people who simply want to take time to view the Northeast region from other perspectives. Over 7 days you will participate in 7 projects with visiting artists as part of a temporary learning community. Tickets are available for the full week: £100 including accommodation and food whilst at Burnlaw Centre, Northumberland (where we will stay for 3 nights from Saturday 8 July). Northeast bursary: Available to 3 applicants who live and work in the Northeast region and are not currently enrolled in full or part-time Higher Education. Travel bursary: Available to 3 applicants who live and work outside of the the Northeast region of England. Applicants are welcome to apply regardless of current education enrolment. The award of the Travel bursary acts as a participation fee waiver. To apply for one of the 6 free places, please submit a 300-word expression of interest, explaining why you would like to take part in the Summer Lab, along with your name and location of residence. Send it to info@circaprojects.org no later than 5pm on Friday 23 June. Make sure to state which bursary you are applying to in the email subject. All applicants will be informed of the outcome by no later than Tuesday 27 June.